I was born and raised in Detroit, Michigan, which is 82% Black American. In contrast, Dearborn, MI, which borders Detroit, has the highest concentration of Arab Muslims in the country and also is home to the largest masjid in the country. I attended Wayne State University (WSU), which is located in Detroit (the actual city, not the suburbs). Compared with other universities, the campus was not large and much of it included the city of Detroit itself. However, I knew WSU had a lot of Muslim students so I was excited to meet fellow Muslims. Yeah well… with a few exceptions, many of the non-Black Muslims looked at me with disdain, as if I walked around with something on my face. The first Muslims that I met on campus were a Somali family from Canada who I loved dearly. After (semi)joining the Muslim Student Association (MSA), I met another sister who was kind to me, treated me like a normal person and actually asked me about my community and my teacher. I met a few Muslims after joining other school organizations who were cool also. Other than that, I stayed with my own friends who were primarily Black American Muslims as well. It’s safe to say that my entrée into college was a cultural shock. The few times I went to an MSA event, I could feel eyes burning down my back. 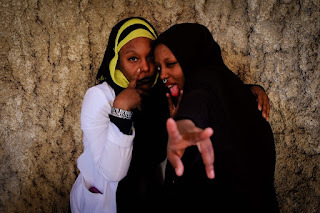 Every now and then, a sister would question me about my style of khimar (often times in a bun and accessories adorning my head, or African fabric wrapped up high in a gele or wrapped tightly around my head with multiple colors and patterns), as their friend with no khimar stood by and watched the interrogation. When I walked around campus and gave sisters the greetings of peace, they would either ignore me or just say a half-hearted “salaams” in return. One time, I volunteered at a dawah table during Islamic Awareness Week and none of the sisters at the sisters’ table spoke to me, even though I tried repeatedly to be social and involved in the conversation. I once had a sister who saw me with my KhaliqArt skirt on, saw the letter “Kha” and asked me if it was haram (prohibited in Islam). Mind you, it is a letter…of…the Arabic alphabet. That’s akin to asking if wearing the letter K on your shirt is un-American. My expression of my Black Muslim identity (American clothes, khimar style and knowledge of Islam) was being challenged. I couldn’t understand why; and for a while, I felt conflicted. To be considered a “real” Muslim, you have to fight for Palestine, Iraq and Iran? I have no problem speaking out against injustices inflicted upon brothers and sisters in the Middle East, but I often wondered why the same importance wasn’t given to the brothers and sisters in Africa or their distant relatives in America? It’s safe to say that the realization of the racism in the Muslim community was eye-opening. I had expected to be welcomed into a global community like I had been part of it since birth, yet I was being ignored and dismissed as a Black Muslim. The denial of Blackness in Islam is not a new phenomenon. Just as American textbooks would have us believe that our history started on plantations, some in the Muslim community would have you believe that Black Muslims don’t exist, or that we’re just relegated to being an abeed (slave). Mind you, the richest person ever in the history of man was Mansa Musa —an African Muslim king. One of the most influential men in American history was Malcolm X, a Black Muslim man. However, you rarely hear non-Black Muslims speak of Mansa Musa; and when Brother Malcolm is mentioned, often it is in a way that seeks to separate him from his activism. Brother Malcolm to be exact, was firm and grounded in his Blackness, even after he made Hajj. Yes, Hajj introduced him to a broader, global view of Islam, but that in no way prevented him from continuing to fight for the justice of his people. You have to be in tune with your Blackness to even fathom the plan Malcolm had for his people. When I was younger, I sometimes tried to understand why some non-Black Muslims would look at me with such disdain. The answer is simple: while Islam does not condone or promote racism, cultures do. And because I am proud to be a Black Muslim woman, it scares some people. Why?